One of the world's most recognized transportation systems, TFL (Transportation for London), known for their iconic red, double-decker buses, has contracted for the manufacture of a brand new, battery electric replacement. 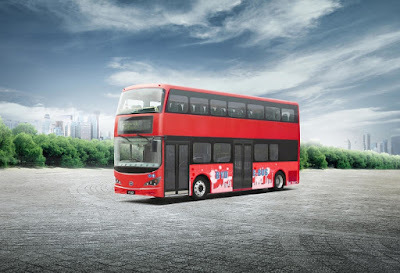 The company selected to build the next generation London Bus double-deckers is global electric vehicle leader, BYD Company Ltd.
BYD's Battery Electric bus employs many advanced technologies developed in-house by a staff of more than 15,000 R&D engineers including the BYD Iron-Phosphate Battery which boasts the only 12-year-battery warranty in the industry. Combined with BYD's proprietary hub motors and regenerative braking system, the BYD battery electric bus offers the lowest life cycle cost of ownership. The BYD electric bus delivers a host of operational and environmental benefits for public transit riders, bus operators and residents of the community – it is very quiet and ensures a comfortable ride without vibrations, jerks or the noise associated with the conventional buses and combustion engines. The bus can also drive for more than 155 miles even in heavy city traffic on a single charge. As of April 1st, 2015, BYD bus fleets have completed greater than 50 million miles "in revenue service" and have been evaluated by more than 150 cities in 36 countries around the world. To date, BYD has built over 5,000 electric buses globally, making it by far the most popular electric transit vehicle on the planet.